I am good at breaking needles, pricking my fingers till they bleed, and ripping nylon thread meant to withstand a 30 pound test. If I see a washer or a gear that fell off somebody’s old bike on the road, I pick it up for my “stash”. In a word, I practice micro-macramé. 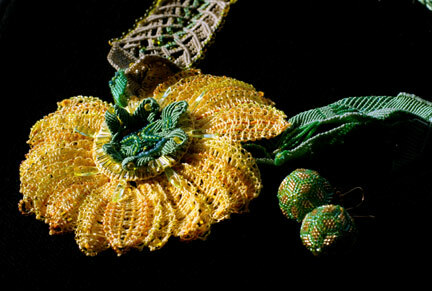 Micro-macramé is an art form akin sculpture because it is three-dimensional. The work plane evolves under my fingers, rubbing them hard and forming calluses. It is different from sculpture because I am creating the medium I work with - the fabric of the art: the cords, netting, and the knots, which are formed into a desired shape. I use silk, nylon, hemp, and cotton thread combined with a variety of semi-precious stones and beads. All my pieces are three-dimensional. When I took figure drawing at CSUN (Northridge), my instructor told me that I have a good sense of volume - no doubt it has been developed during my macramé work. It is a misconception that people who cannot paint or draw cling to crafts. I love drawing, but micro-macramé allows me to create wearable art, so I can take my self-expression with me wherever I go. 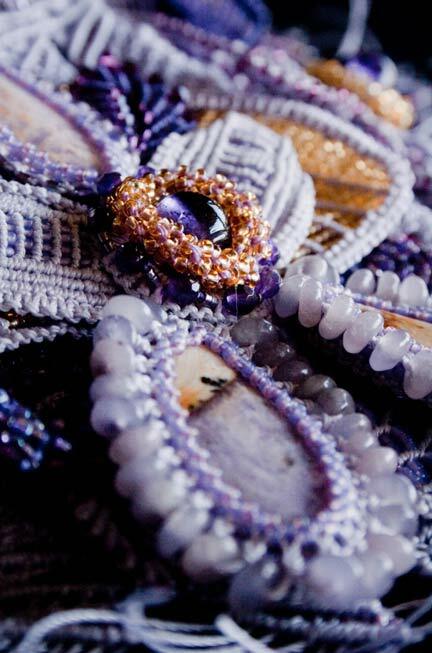 Beading and micro-macramé provide an opportunity for me to explore my creativity. I love the feeling of looking at a completed project and thinking, "Did I make this?" The project comes together subconsciously. All of a sudden I have an idea, and I do not know where it came from. 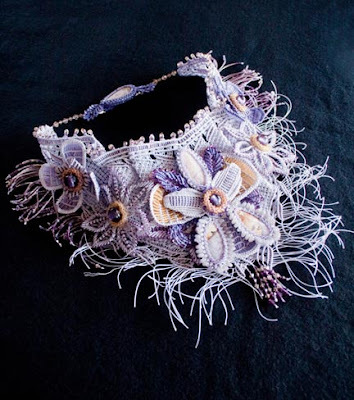 I know what influences me: the work of other beaders and macramé artists, such as Tatiana Van Iten, Joan Michaels Paque, Fran Stone, flowers that I grow and admire, and the desire to feel like a princess. Yes, it sounds childish, but when I hear complements from friends about my necklaces, I feel special, and this is probably what drives my desire to create yet another piece. It is similar to creating an alternate reality filled with beauty and perfection. Sometimes, the ideas come to mind when I am reading an article for work, and I start drawing on the article itself. Then, a few months later, when I return to the article, I discover my drawing and think, "Wow, that's a great idea, I should really make this." It's a great feeling, when I have more ideas than I can possibly implement. I hope this feeling never goes away. I experimented with several mediums over the summer, but I have now returned to micro-macramé – my true passion. Oh my - that yellow one is just gorgeous! I am one of those fiber artists from the 70's and I take exception to your comment: "Micro-macrame is nothing like the macrame from the 70s! Although it may use many of the same basic knots, tell me that you ever saw pieces that looked this good back then ;-)" Take a look at Joan Michaels Paque. Considering we did not have the wonderful materials we have today, our work in the 70's made "fiber art" a viable art form for others to follow.